'Just Imagine' (Janet Hutchinson, R. 1998). Seedling WH/OP/ST. LA, 41" (104 cm), Midseason late bloom. Standards white, veined lilac, green base; style arms pale lime green, white crests lightly veined lilac; Falls white, sanded and veined lilac (RHS 76A), white line edge, green and white reverse, signal medium yellow, short, broad, raised green centerline extending outward; lightly ruffled, picotee edge; slight fragrance. 'White Heaven' X 'Our Parris'. 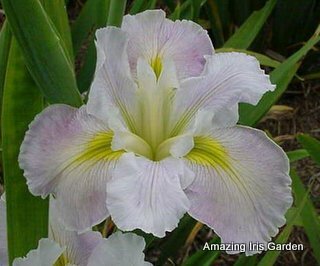 Iris Haven 2001/02.